Scientists Crack A 50-Year-Old Mystery About The Measles Vaccine : Goats and Soda When the U.S. introduced the measles vaccine, childhood deaths from all infections plummeted. Scientists think they might know why: Benefits of the measles vaccine go way beyond the measles. Worth a little pain? 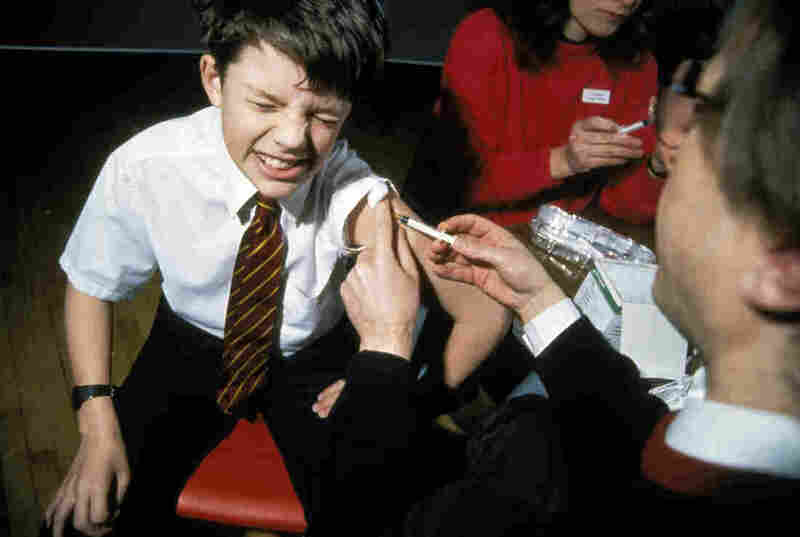 Back in 1990, a school boy got a measles shot in the U.K., and it turns out, he got more than protection against the measles. Mina and his colleagues think they now might have an explanation. And they published their evidence Thursday in the journal Science. Now there's an obvious answer to the mystery: Children who get the measles vaccine are probably more likely to get better health care in general — maybe more antibiotics and other vaccines. And it's true, health care in the U.S. has improved since the 1960s. But Mina and his colleagues have found there's more going on than that simple answer. The team obtained epidemiological data from the U.S., Denmark, Wales and England dating back to the 1940s. Using computer models, they found that the number of measles cases in these countries predicted the number of deaths from other infections two to three years later. "We found measles predisposes children to all other infectious diseases for up to a few years," Mina says. And the virus seems to do it in a sneaky way. This idea of "immune amnesia" is still just a hypothesis and needs more testing, says epidemiologist William Moss, who has studied the measles vaccine for more than a decade at Johns Hopkins University. But the new study, he says, provides "compelling evidence" that measles affects the immune system for two to three years. That's much longer than previously thought. "Hence the reduction in overall child mortality that follows measles vaccination is much greater than previously believed," says Moss, who wasn't involved in the study. That finding should give parents more motivation to vaccinate their kids, he says. "I think this paper will provide additional evidence — if it's needed — of the public health benefits of measles vaccine," Moss says. "That's an important message in the U.S. right now and in countries continuing to see measles outbreaks." Because if the world can eliminate measles, it will help protect kids from many other infections, too.